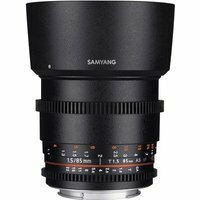 The Samyang 85mm T1.5 AS IF UMC II lens is a fast, medium telephoto prime designed for shooting high-quality video on Sony's full-frame compact system cameras, such as the a7 models. The gearing on the focus and aperture rings allow you to follow focus and provide you with aperture control from a professional camera rig. The aperture ring has also been de-clicked, which enables smooth iris pulls. The focal distance and aperture settings are clearly marked on the side of the lens barrel for convenience. The large T1.5 aperture enables you to capture sharp images in low-light situations and also gives a beautifully blurred background.